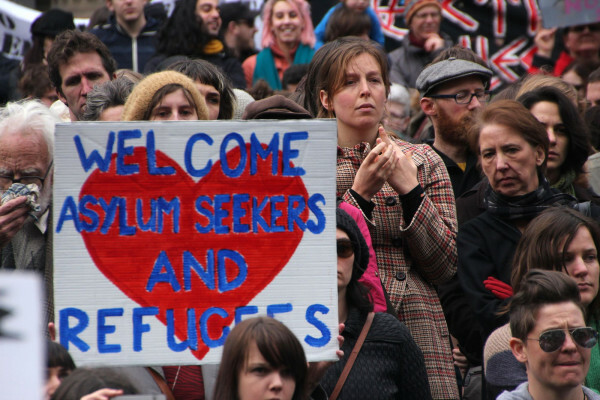 A rally for refugees' and asylum seekers' rights in Melbourne, Australia, in July 2013. Because I am a white American who comes from privilege, I have the luxury of deciding when or even if I will try to help make the world a better place. I’m not personally bumping up against mistreatment or unkind behavior on a daily basis. The systems’ rules apply to me, and I’m also not punished by them. I am without physical disabilities. I’m cisgender, healthy, well-educated and Christian. People who hold power don’t get uncomfortable because I “seem different.” Doors are open for me, and I know it. Staying undaunted: This is the challenge for those of us not forced to fight adversity simply because of the life we were born into. We care and want to do what we can to make the world a better place. How do we see all the work that needs to be done and not just throw up our hands, retreating into the safe islands of our privileged lives? Those of us for whom activism is a choice can define for ourselves what “doing justly” means. Maybe it’s as simple as sharing links to articles, making donations to local charities or reading multicultural books with our children. Maybe it’s participating in 350maine.org events to fight for climate justice, joining a political campaign or offering pro-bono professional services to an organization in need. It’s true that taking those actions, which are relatively convenient to many of our lives, is better than doing nothing. First of all, what a relief. It seems common sense, but it’s important for me to realize I am not responsible for solving the problem; I do not have to try to “complete the work.” Some important and effective activists promote the idea they will “ win.” And while I appreciate using “winning” as motivation, for me, setting aside the final goal makes taking concrete action more palatable. What an important challenge, too: “Neither are you free to abandon it.” I must recognize my responsibility as a human being is to not abandon the work. I believe “the work” must go beyond being a good mother to my children. It must go beyond what fits in my everyday life, without much difficulty. It must push me not just slightly out of my comfort zone but far out of it. The work may — must? — have personal costs for me if it is going to make a real difference. I’m using my privilege to take time to consider what my next more radical or challenging actions will be. In the meantime, I’m doing those small and mostly convenient things I can do from my relatively privileged position. Those things that are better than nothing. For example, I compost our organic waste. I’m attending the “Refugees are Welcome” rally with my children on Dec. 6. I volunteer my time with organizations doing important work. I’m striving to live justly, loving mercy and not abandoning the work. I encourage those among you who have the luxuries of privilege I do to move beyond the simple actions we make with good intentions and little effort. Move into areas where we feel uncomfortable. Take your actions a little further. Find ways to make sacrifices that “hurt” so together we can all really make a difference.